The Branch now has 10 members who have come to Scotland from Africa. Their account of the importance of the Mothers’ Union in their country is very interesting. In Nigeria, the wearing of a uniform is extra special. There is a long training period before being enrolled as a member. They are only then able to buy material for their uniform from the Bishop's wife (who is the only person allowed to keep this material). The material is blue in colour with a portrait of Mary Sumner in a circular frame printed on it. Special tailors make the dress, making sure that whatever style of dress is required, the Mary Sumner portrait is always on the front and no cuts or seams would spoil the portrait. 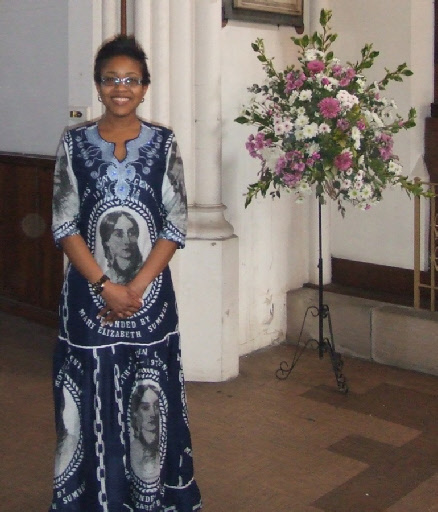 Many are adorned with beadwork, embroidery and crochet work as Chioma’s robe shows. The Eucharist service on April 29th, 2012 was a highlight in the history of the branch. 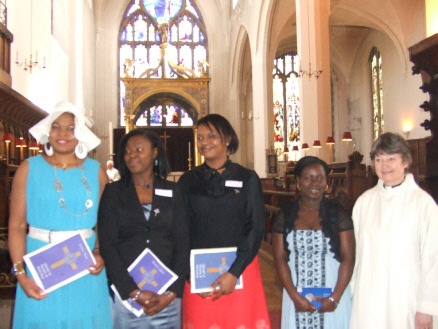 Martina Chukwuma-Ezike, Oge Ibenegbu, Obianuju Ogbodo, Nkechi Okorafor, and Rev. Moira Paterson were enrolled by Provost Richard Kilgour supported by the Diocesan President - Mrs. Chris Crosley and Branch Leader - Mrs. Sonia Hudson. At the same service members presented three hand - embroidered Mothers Union kneelers to be blessed and to be placed in the Lady Chapel. It was a very joyous occasion. On April 24th, the branch held their Annual Easter Party which they decided to amalgamate with a Diamond Jubilee Party. 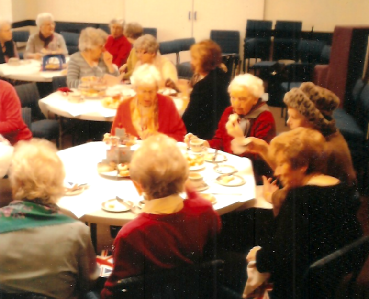 Members, along with visitors from St. James, Queen Street Guild and St. Peter’s Roman Catholic Church, enjoyed an old-fashioned afternoon tea, then tested their memories answering a quiz about the royal family, royal residences and general knowledge. The event finished with a 'sing- song' of popular 1950's songs ably accompanied by Mr. Stanley Flett.